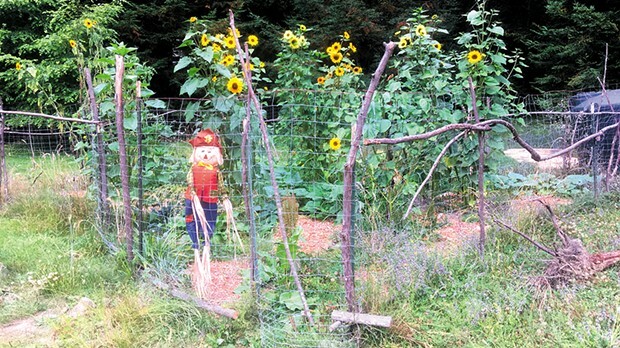 Old-school scarecrow and deer fencing. Of any home farm management issue, vertebrates (animals with a backbone) can be the most challenging and expensive to deal with. Deer, bears, gophers, mice and rats all carry diseases that can be caught by humans and potentially threaten home farm harvests. Growing up in the walnut orchards of Central California, one of our biggest vertebrate management issues was ground squirrels. These varmints burrow at the base of mature walnut trees, which weakens the root system. After investing 10 years nurturing a walnut tree to maturity, the last thing any farmer wants is to lose the harvest. Pesky ground squirrel digging activity might cause a productive tree to be toppled by a strong wind. Back then, the best way to deal with ground squirrels was to shoot them with a BB pellet right between the eyes from the back of an ATV. My bestie growing up learned how to shoot ground squirrels as an 11 year old and to this day I have no doubt she remains the fastest shot in the West. Each home farm presents a unique vertebrate management situation. In some neighborhoods, high-jumping deer might offer the biggest threat to successful home gardening. In those cases, an 8-foot-tall fence is the way to go. Other places might have a raccoon problem. These masked bandits like to eat fruit right out of the tree and wash their paws in the outdoor cat water dish on the way home. 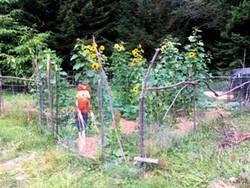 Netting the fruit will keep those little pests away from home-grown bounty. Not feeding raccoons with any kind of human or domestic pet food remains of vital importance. Wild animals are smart — they remember the spots with the most snacks and return again and again. Our North Coast home farm lies in a bustling neighborhood close to a school. We could have rats, gophers, mice, deer, raccoons, skunks or possums show up any day of the week. These uninvited guests might go through the compost pile (which we don't mind), dig a hole and leave a pile of soil behind (moderately annoying), chew off the roses (aggravating) or spray our beloved dog with a cloud of nauseating stench (immediately life-changing). There's nothing we can do to keep these vertebrates entirely away so we've learned to live with them. We move dirt piles from gopher holes to the compost pile, keep the roses out of the deer zone and keep the pooch away from the skunk den. We follow biodynamic principles here on the home farm, so we live in harmony with the natural environment around us. We want to harness the power of animals to help boost farm productivity. Our home farm provides foraging habitat for housecats, both from our house and others in the neighborhood. We like the cats on the farm because they keep rodent populations down. Cat territories have been carefully carved out in the yard, with certain cats occupying certain corners at different hours of the day. Male cats tend to occupy larger habitats than females, and age and experience leads to higher alpha status with larger territories. We recently lost our alpha cat, Banjo, a fine male specimen who grew up on the streets of Portland. Banjo's spot in the yard was a front and center lavender patch, where he would curl up and enjoy the afternoon sunshine. As an alley cat, Banjo learned to live off the land and he was a voracious hunter with extremely long whiskers. Banjo became seriously ill recently, going from healthy and frisky, peacefully lounging in the lavender patch, to death within 48 hours. Although we live within walking distance of excellent veterinary care, there was nothing they could do to save him. While an autopsy was not performed, he showed symptoms consistent with kidney failure. We suspect poisoning from a rodenticide — one of our neighbors, intending to kill a gopher or a rat, may have accidently killed Banjo. Casual application of these harmful chemicals in neighborhood backyards can have a discernable effect on housecat populations. Toxins in prey, such as mice, are accumulated and magnified by a factor of 10 for any predator. Some poisons for rodents are intended to act slowly so that the animal has a chance to go to its home and die. Perhaps Banjo accidently ate something that had recently come across poison. Of all the things one can do as a home farmer, choosing to ban any kind of poison from the farm is a huge step forward in the improvement of home farm ecosystem quality. Chemical companies wish to tempt us with their wares and promises of less labor and more reward. However, the big cost no one mentions is that poison can kill beyond what the applicator directly intended to kill. Living on a farm, we grow used to the cycles of life and death. Banjo wasn't the first cat we've lost and he won't be our last. It's important to remember we're all connected by the same wind, rain and earth. Our neighbors' decisions can mean big things for us as farmers and vice versa.